Teatru Astra is proud to announce its fourth consecutive musical – Joseph and the Amazing Technicolor Dreamcoat. 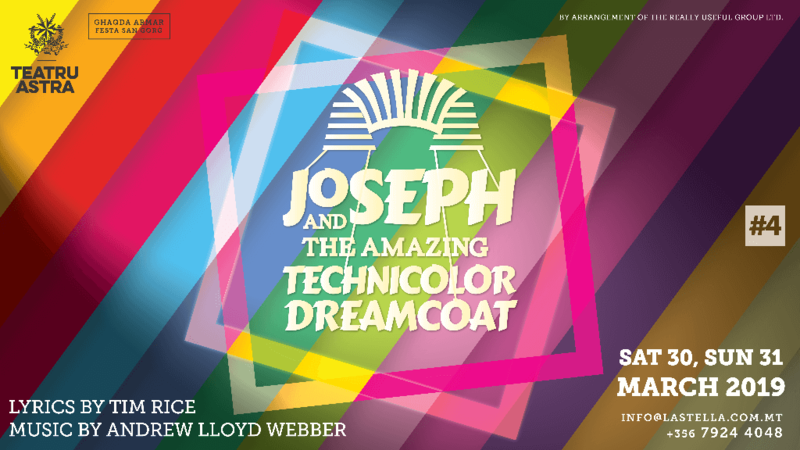 Retelling the Biblical story of Joseph and the coat of many colours, this magical musical, the UK's longest running, is full of unforgettable songs including Those Canaan Days, Any Dream Will Do and Close Every Door To Me. The announcement follows the theatre's tour-de-force in Jesus Christ Superstar earlier in March and April this year. Joseph and the Amazing Technicolor Dreamcoat is another musical penned by Tim Rice and composed by Andrew Lloyd Webber – the first collaboration of these mammoth figures in the field of musical-theatre. A double representation of Joseph and the Amazing Technicolor Dreamcoat is scheduled for Saturday 30 March 2019 at 20.00hrs, followed by a matinee performance on Sunday, 31 March 2019 at 16.00hrs.